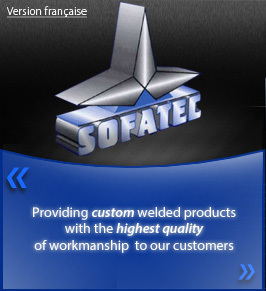 Founded in 1997, Sofatec was born from the association of four individuals, each with over 20 years experience in the manufacturing of machinery and mechanical welding of steel parts industry. With over 80 employees, Sofatec is able to respond to an increasingly large clientele and deliver total satisfaction. Sofatec has always believed that a commitment to quality and workmanship are the backbone to any successful manufacturing process. Sofatec has the ability to design, engineer and fabricate the unique custom product that ensure the successful operation as you have planned. Sofatec team can work from your drawings or from your data sheets. Detailed fabrication drawings can be generated through our state of art CAD system. Calculation can be made on pressure vessels designs using our extensive set of computer programs such as Compress.